With their oldest son heading to college in five years, Heather and Dave Stanley knew it was time to confront their credit card debt and put their family of four in a better financial position. 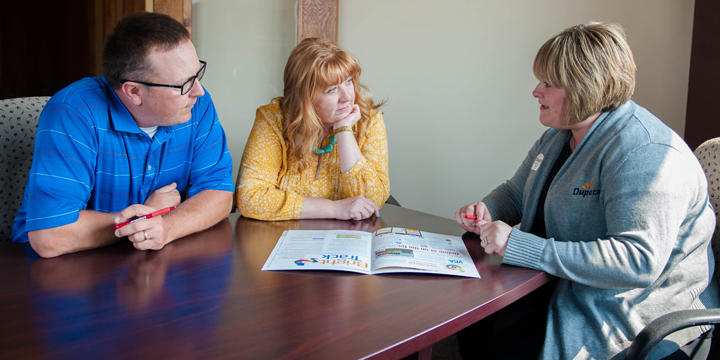 The Coggon couple decided to give Dupaco a try, scheduling a free Money Makeover at the credit union’s Manchester branch. Not only did the Stanleys leave with a plan to tackle their debt, they also learned invaluable budgeting and saving strategies to help them kick the credit card cycle for good. After reviewing the couple’s financials, Dupaco’s Carrie Crane and Megan Francois crafted a plan to consolidate the debt with a home equity line of credit and a personal loan—saving the couple hundreds of dollars in monthly payments. The savings didn’t stop there. Reviewing their budget also uncovered leaks, prompting the Stanleys to move their auto insurance and renegotiate their Internet package. Dupaco helped the couple put those savings to work, establishing multiple savings accounts for the things that matter most to them. The Stanleys have made Dupaco their financial home.